Tucson City Hall is located at 244 West Alameda St, Tucson AZ 85701; phone: 520-791-4201. Photo: Harold Bell Wright Estates, ca. 1950s, 6451 East Shepherd Hills, Tucson, AZ. The Historic District was listed on the National Register of Historic Places in 2011. Photographed by User:Ammodramus (own work), 2012, [cc-by-1.0 (creativecommons.org/publicdomain/zero/1.0/deed.en)], via Wikimedia Commons, accessed April, 2013. The name "Tucson" first appears in writing on a 1695 map drawn by the Catholic Priest, Eusebio Francisco Kino. The Tucson mission, San Xavier del Bac, became the northernmost point in the Jesuit mission system, designed to carry out a program of pacification centering on conversion and education of Native American communities. Native peoples were drafted into hard labor to further Spanish mining interests for the Crown (Polzer 1986). Increasing wealth in the region fueled local resentments toward the Spaniards, eventually resulting in the Pima revolt of 1751, which spurred provincial officials to develop a military garrison to protect Spanish interests. In 1767 a royal decree replaced the Jesuits with the Franciscans, ushering in a period of heavy military and local governmental involvement in the region. Control and distribution of resources was transferred from the friars to local governmental officials, reflecting a pattern of separation of religious and government authority that was occurring in Europe at the time (Polzer 1986). Establishment of what became present-day Tucson began with the site designation of a new frontier presidio by Hugo O'Conor on Aug. 20, 1775. O'Conor, an inspector for the Spanish army, chose this location for the new presidio as part of a larger plan to open up an overland supply route between New Spain and California. The post was also expected to protect the Mission of San Agustin del Tucson from attack by local Apache tribes. O'Conor located the presidio on a low mesa above the flood plain and east of the Santa Cruz River. The presidio's fortifications were originally built as a wooden palisade and later reconstructed of wide adobe bricks. The presidio measured approximately 750 feet square with walls about six feet high and two feet thick (Gallego 1935; Greenleaf and Wallace 1962). Because of the frequent occurrence of Apache raids, most of the living quarters that housed soldiers, families, and settlers were contained within the walls of the presidio. Any development around the presidio remained extremely limited through the early 1800s. The first expansion beyond the walls of the presidio probably occurred around the time of the California Gold Rush of 1849 (Harris no date). Prospective miners moved westward along Cooke's wagon trail past Tucson en route to California. Tucson, known for its good water and equipment, became an important supply station. Tucson's commercial establishments were still limited at that time to a saloon and blacksmith shop within the presidio walls and three small supply stores just beyond (Gallego 1935). Gallego, Hilario. "Reminiscences of an Arizona Pioneer." Arizona Historical Review. Vol. 6 (1) January 1935: 75-81. Greenleaf, Cameron and Andrew Wallace. "Tucson: Pueblo, Presidio, and American City. A Synopsis of Its History." Arizoniana, Summer 1962, 3(2):18-27. Polzer S.J., Charles W. "Black Robes, Black Springs and Beyond." In Tucson: A Short History. 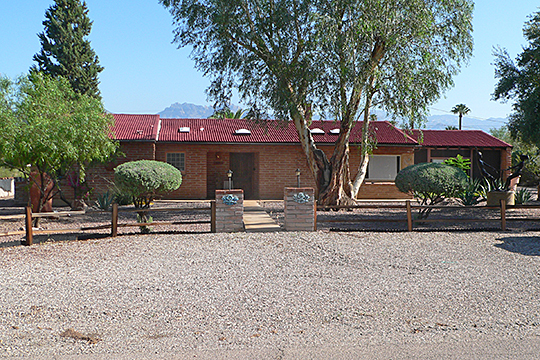 Tucson: Southwest Mission Research Center, 1986. Janet Parkhurst, R. Brooks Jeffery, Robin Pinto, Nancy Mahaney, Melissa Rees, Goran Radovanovich, Patricia Rogers and Kris Jenk, Preservation Studies class (ARC 4/597J). College of Architecture, Planning and Landscape Architecture, The University of Arizona, Historic and Architectural Resources of Downtown Tucson, Arizona, 1775-1970, nomination document, 2002, National Park Service, National Register of Historic Places, Washington, D.C.